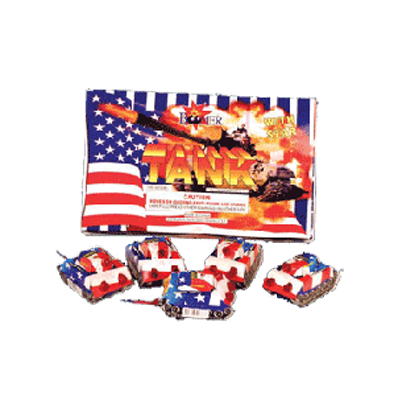 Tank w/ Star (Box) – Drives foward and backward on any hard surface emiting quiet showers of multi-colored sparks. Army Smoke - Just pull the pin and this novelity item will start to emit smoke. 14" Morning Glory - Long burning flitter sparkler that burns with many colors with a torch-like effect. Big Smoke Grenade - Jumbo smoke grenade that changes colors! Just pull the string and this grenade will get started. Big Fire - These small packets are used on campfires. When applied, your fires burns in various cool colors! Caesar - Safe and sane assortment. 2 Hour Punk - Punks that last an hour or more!